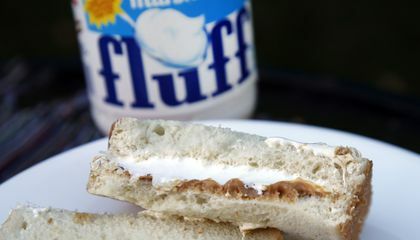 Fluff turns 100 this year, and the marshmallow concoction that has been smeared on a century's worth of schoolchildren's sandwiches has inspired a festival and other sticky remembrances. 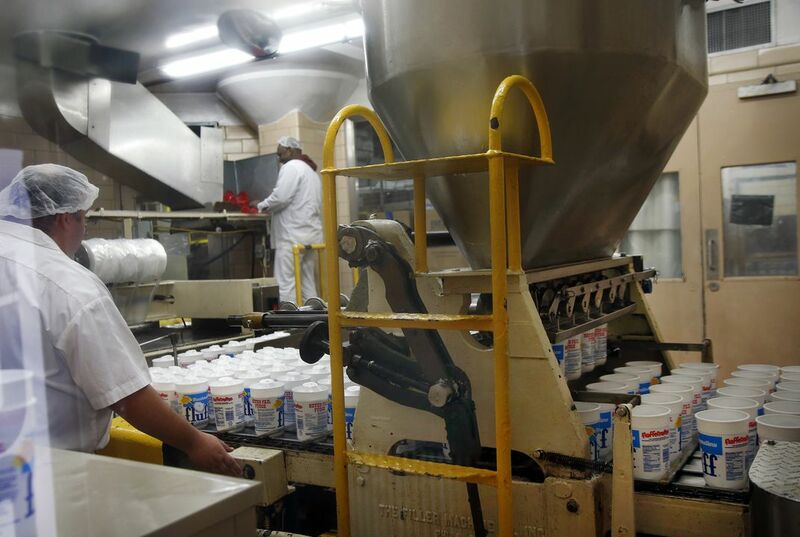 Every year, between 5 million and 7 million pounds of the sticky cream invented in suburban Boston in 1917 is produced and sold worldwide, although half the supply is bought up by New Englanders and people in upstate New York. It came of age in the 1960s, when generations of schoolchildren started clamoring for "Fluffernutter" sandwiches - still made by slathering peanut butter and Fluff between two slices of white bread. Over the past decade, fans of Fluff have been staging an annual "What the Fluff?" festival in Somerville, Massachusetts, where the American lunchbox icon was born. In 1917, Montreal-born confectioner Archibald Query crafted the original recipe. Query is said to have whipped up the first batches in his own kitchen in Somerville before selling it door to door. Following World War I, there was a sugar shortage in the U.S., so Query sold the recipe for $500 to two war veterans, H. Allen Durkee and Fred L. Mower. The recipe has stayed with Durkee Mower Inc. ever since. It's the only product the family-owned company makes. In 1920, Durkee and Mower began producing and selling Fluff, which they first named Toot Sweet Marshmallow Fluff. The company moved to a factory in East Lynn, Massachusetts, in 1929. The original recipe hasn't changed: corn syrup, sugar syrup, dried egg whites and vanillin. And the jar's packaging is only slightly different, according to Mimi Graney, author of a forthcoming book, "Fluff: The Sticky Sweet Story of an American Icon." Fluff lovers "associate it with their own childhood and image of home," Graney says. There are competing products sold by Kraft, Solo Foods and others. The 12th annual "What the Fluff?" Festival will be staged in September. It was started as a way to rejuvenate Somerville's now-trendy Union Square neighborhood. The festival draws about 10,000 people. They gather for activities including cooking and eating contests, Fluff jousting, Fluff blowing, a game called Blind Man Fluff and concerts. Somerville residents tend to have a soft spot for Fluff. "It totally takes me back to my childhood," said Amy Hensen, a 43-year-old Somervillian. Mayor Joseph Curtatone likens the product to his community's eclectic vibe. "It's original, creative, and a little bit funky but that's why we love it," he said. U.S. astronaut Sunita Williams, who spent 322 days in space on two missions to the International Space Station, made Fluffernutter sandwiches on board. Williams attended high school in Needham, Massachusetts, so Fluff was a comfort food. Why is Fluff connected to childhood? i think fluff is connected to childhood because children love sweet, and sticky things and fluff is both. I really found this story interesting. I had no idea that marshmallow fluff was this old. I thought it was created to please todays sugar loving kids. I also found it very interesting that this is the only product the company makes. For some reason I thought marshmallow fluff was made by Kraft. Its really nice that they have a festival to celebrate marshmallow fluff. I would like to go, it seems really cool. I love Marshmallow fluff. This article gave me more insite to how this amazing sandwich maker. The article covered how it was invented, what's in it, and how a festival in Somerville, Massachusetts honors the Fluff. I've been having fluffernutter sandwiches since I was in early elementary school so I can relate to when people say it's amazing and how it can bring back memories. I think Fluff is one of the most ingenious items ever made, because it is yummy, makes a great sandwich, and kids all over love it!! 2017 is the 100 year anniversary for Fluff; a popular marshmallow creme in America. Americans often like to smother the fluff, along with peanut butter, between two pieces of bread to make a deliciously comforting sandwich. The first batch of Fluff was made in 1917 by Archibald Query. While he did sell his recipe following WW1 and the sugar shortage, Fluff is still made the same today as it was when Query first produced it. Every September for the last 12 years, there has been an anniversary honoring the Fluff in which around 10,000 Fluff lovers come out to celebrate. Consumers love the originality of the food and how it brings them back to their childhood. This article is about the classic Fluff. Fluff started in Somerville, Massachusetts 100 years ago. Archibald Query invented the recipe: corn syrup, sugar syrup, dried egg whites and vanillin. After selling door to door, his product was sold to two war veterans for $500 dollars during a sugar shortage. H. Allen Durkee and Fred L. Mower first named the creation Toot Sweet Marshmallow Fluff and began producing it at a factory in East Lynn. To this day Durkee Mower Inc. still produces the Fluff and it's still a hit. This year will be the 12th annual "What the Fluff?" Festival. It will be hosted in Somerville in September where people can participate in activities consisting the Fluff. I can relate to this article because as a little girl, I loved eating the Fluff. However, I don't eat it in sandwiches anymore, but I do dip my strawberries and other fruits in it sometimes. Delicious! I think that the white fluff of goodness is a great iconic feature I remember as a kid and it brings back some really good memories I had as a kid. The story made me think how I use to eat that with a spoon all the time. My older sister at that time always got mad at me for always eating it all the time. The history of it all really makes me understand it more and I appreciate it now that I am older. This article was about the history of the world famous sandwich spread, Fluff. The article starts of with some facts like how much is produced each year or how there is an annual festival to celebrate this yummy product. Something that I didn't know until after reading about the Fluff is that they're still doing the same thing that they have been doing for 100 years. A few examples of this is how they the Fluff recipe has never changed, there is no other produce produced by the brand, even the packaging has not changed much from the original 1917 version. I chose to read this article because back when I was a child, I would love eat Fluffer Nutters after school. Now a days I tend to stay away from the tasty Fluff so I can stay fit. I enjoyed learning more about the origins of the classic, nostalgic, 100 year old company, Fluff. This posts is about the history of the marshmallow fluff recipe. They wrote this post because the recipe is turning 100 years old. The recipe was invented because the sugar shortage after world war I. In 1920 two men started producing and selling marshmallow. The article'Everything You Need To Know About Fluff' talked about how the popular, marshmallow substance, that is commonly spread on sandwiches and other foods, is turning 100. Festivals and gatherings are being held to celebrate, and many games involving the spread are being played. I thought this article was very interesting because I have taken cold lunches to school ever since I was in pre-school, and I've never had anything like this in my lunch. It was interesting to see that products like this exist and I think I'll be talking to my mother about picking some up to try. This article is about the product consumed by many called "Fluff" turning 100 this year. Archibald Query was the man who first whipped this up in his kitchen before selling. He lived in Somerville, Boston. I love sandwiches and I've never heard of this but people put it on them with peanut butter.